A unique shampoo and conditioner from Canada that boosts the rate of hair growth - perfect for slow growing hair or to outgrow a bad haircut. FAST is a herbal product that really does work to supercharge hair growth. We have been selling this product for over 5 years now with excellent customer feedback. FAST works by feeding hair with essential nutrients, proteins and aminos. Use FAST daily for 1 month and you will see longer, faster growing and healthier hair...or your money back! 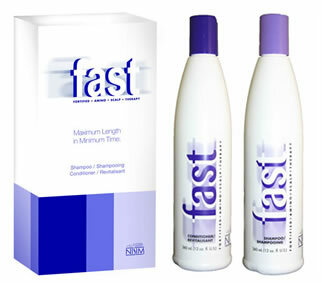 FAST is suitable for all hair types - from coloured and highlighted hair, to afro and damaged hair. If you suffer from stunted hair growth or are desperate to outgrow a dreadful haircut, FAST is the safest product you can try - tried and tested by 1000s, with independent reviews and feedback, we are so confident in this product that we offer a 60 DAY Money Back Guarantee! Yes! It really works. FAST works by feeding the hair with essential nutrients, aminos and proteins not found in regular shampoos. This special blend provides essential nutrition to hair, making hair grow as fast and as healthy as possible. Note: FAST will only affect the hair on your head; it will not affect facial or body hair. Why not hop on over to Facebook and ask your question. While you\'re there, please Like our page... Thank you! 60 DAY GUARANTEE: Try FAST and if for any reason you are dissatisfied then simply send it back to us for a full refund! Please note that FAST is NOT a hair loss product. If you do suffer from hair loss then click the Hair Loss menu option above and view the Nisim New Hair Biofactors range. Slow-growing hair is the source of frustration for many people. A bad haircut lasts months (instead of weeks) when your hair growth is slow. Trying to keep up with the latest hairstyles can be aggravating. But now, with FAST, a safe, all-natural blend of herbs and essential amino acids made in Canada, hair can grow up to 99%* faster and have more body and shine than you ever imagined. Use FAST for just one month and you'll begin to see amazing results. If your hair grows at a rate of 1 inch per month, your can expect an increase to as much as 2 inches per month. That means you'll have longer, stronger, more beautiful hair in half the time. Note: FAST will only affect the hair on your head; it will not affect facial or body hair. FAST is a scientific blend of fortified essential vitamins, amino acids and herbs created for long-term use. This formula is designed to penetrate the hair shaft quickly allowing you to grow hair at hyper-accelerated rates. The hair will grow faster, will be silky soft and more healthy than ever before. FAST actually rejuvenates your hair as it causes faster hair growth. In fact, FAST is completely safe and can replace your current shampoo and conditioner for daily use. FAST works on all types of hair, and in both men and women to grow hair. It can be used safely in conjunction with any other processes or treatments (coloring, permanent waves, relaxers, weaves, etc.) without fear of negative side effects. Most shampoos and conditioners simply cleanse and condition. FAST is different; not only will it leave your hair squeaky clean, it will also provide much needed nutrition to the hair, so your hair will grow fast and healthy. FAST can replace your daily shampoo and conditioner - in fact it is so safe it can even be used on children's hair. FAST is not a hair loss product. FAST is for someone whose hair has stopped growing, or for someone who wants to boost their hair growth (perhaps following a bad haircut). If you are losing hair or your hair is thinning, we recommend using the Nisim Biofactors range of hair loss products. The Nisim and FAST brands are made by the same company and have the same high quality. Extensive information on this product is available on the FAST U.K web site. * New 2011 Clinical Trial Results JUST IN: 50% of the subjects in the study had increased rate of hair growth after 42 days. (Hair growth varies from user to user. 99 percent increase in hair growth is not a guaranteed result). Yes, F.A.S.T has worked for many, many customers as well as high profile beauty editors including those from Tiscali.co.uk and Handbag.com. You just have to read the customer testimonials to see F.A.S.T has worked for many buyers. F.A.S.T is unique – unlike most shampoos and conditioners, it does not just cleanse the hair; F.A.S.T feeds the hair with exactly what it needs to grow as fast and as healthy as possible. For many customers, F.A.S.T not only accelerates hair growth, but it also improves the condition of their hair. F.A.S.T is very gentle and has helped many customers who suffer from mild scalp complaints like shampoo build up, dandruff and itchy scalp. Why should I use F.AS.T? F.A.S.T is unlike most other shampoo and conditioners which just serve to cleanse and condition your hair, often stripping the hair of vital nutrition. F.A.S.T takes haircare to another level; it works on the hair itself, infusing special herbs and amino acids to grow hair as F.A.S.T and as healthy as possible. F.A.S.T is not just as a treatment shampoo and conditioner - use it in place of your regular shampoo and conditioner for great hair condition and maximum growth. It is perfectly safe to use as it contains mostly natural ingredients. F.A.S.T is for anyone who wants to increase their hair growth on existing hair. F.A.S.T is formulated to work for all hair types, from oily to normal to dry scalp, afro hair, on both men and women. It can be used in conjunction with any other hair treatment without causing any fading, bleaching, or any other negative side effects. Does F.A.S.T work for everyone? F.A.S.T is proven to work. In terms of accelerating hair growth it works proportionate to ones natural hair growth. Like all shampoos and conditioners, not everyone will like F.A.S.T! However, most users of F.A.S.T are pleasantly surprised at how well F.A.S.T works and come back for more. For many, F.A.S.T works better than any other haircare product they have ever tried. How do I use F.A.S.T? Shampoo: Wet hair. Apply F.A.S.T shampoo and work into a rich lather. Scrub entire scalp thoroughly and rinse with warm/ hot water. Repeat. You do not need use a huge amount of shampoo – the equivalent of a 50 pence piece is enough for each use. Condition: After shampooing, apply F.A.S.T’s moisturizing conditioner onto the hair and massage in thoroughly. Allow the conditioner to permeate the hair for 1-2 minutes and rinse with warm/ hot water. Style as usual. Do I have to use F.A.S.T daily? For optimum results, F.A.S.T shampoo and conditioner should be used daily as the ingredients contained in F.A.S.T feed the hair with the daily nutrition required.. F.A.S.T is unlike regular haircare products; the shampoo and conditioner are mild enough to use daily and will benefit your hair every time you use them. Some customers use the F.A.S.T shampoo and conditioner daily for 1 month to boost their hair growth and then reduce the frequency of use according to their requirements. If you really do not want to wash you hair daily, but still want to boost hair growth, we recommend taking hair supplements (like Pil Food) daily and washing your hair with F.A.S.T shampoo + conditioner as often as you can. Results will be slower when not using the F.A.S.T shampoo + conditioner daily. I have Afro hair and cannot wash my hair daily. What do you suggest? We recommend you take hair supplements daily and wash your hair with F.A.S.T shampoo + conditioner as often as you can. If F.A.S.T. is used twice day instead of once, will my hair grow even faster? No. F.A.S.T. works similar to a multi vitamin, in that your scalp and hair get an extra boost each day and that is all that is needed. Will my hair continue to grow at an accelerated rate after I stop using F.A.S.T.? No. Like a multi vitamin, it only works while you are taking/using it to feed and nourish the scalp and hair. How long will a set of F.A.S.T last? The shampoo and conditioner are each in bottles of 360ml (12 fl oz). These are larger than your average bottle of shampoo + conditioner and should last about 4-6 weeks with daily use. No. While the shampoo, conditioner and supplements work in different ways, it is not essential to use them all, although by using the whole set you will maximise effectiveness. The shampoo and conditioner must always be used as a set. The supplements are optional. We sell Pil Food supplements which can be used in conjunction with FAST to benefit the hair. How do I take the Pil Food Supplements? It is recommended to swallow the capsules with water during or after meals. Keep away from children and store in a cool dry place. What else can I do to improve my hair ? Massaging of scalp with a stimulating hair brush. Has F.A.S.T been tested on animals? Is F.A.S.T suitable for vegetarians? F.A.S.T shampoo and conditioner are fine to use, however the supplements are not for vegetarians. Can I buy F.A.S.T from a High Street Store? Yes, it's available to purchase in-store at Boots stores and other pharmacies. Please refer to www.fasthair.co.uk for a full list of stockists. You can visit our message board to read previous posts and ask questions. The following is real customer feedback on the results experienced using FAST shampoo, conditioner and supplement combinations. Judging by the feedback we have received so far, 8 out of 10 buyers love FAST and become long term users. This is a new page on our site and we will adding many more comments in the weeks to come. How many times have you been taken in by hair adverts promising an end to problem hair? well did any of them work for you? they didn't for me and believe me when I say I have tried pretty much everything to calm my frizzy straw like hair. I came across F.A.S.T. by accident and thank goodness I did! I nearly didn't buy it as it seemed to be for accelerated growth and not frizziness. But I read on and the more I read the more convinced I was to give it a try. After the first wash I could see the difference, it was much softer and the frizz was noticeably less. I can't tell you how good that made me feel! Still a bit sceptical I washed it everyday as it says and now about ten days later my brittle coarse unstylable hair is now soft, supple and shiny and NO MORE FRIZZ! as for the accelerated growth? well the results I have seen so far are amazing - what can I say i trust this product 100% buy it you'll love it! FAST hair growth formula has been prominently featured in many magazines and newspapers. The manufacturer of FAST is Canadian so all the testimonial videos we have are from American/Canadian buyers at present. Please note that Body4Real is the exclusive U.K distributor and we sell in Pounds Sterling. Grow Your Hair Long with F.A.S.T. Fantastic product. My hair has grown so much faster! fast efficient service & cheaper than boots! Click the button below to add the FAST Hair Growth Acceleration Shampoo & Conditioner to your wish list.